Practising meditation is essentially a way of getting to know ourselves better through familiarizing ourselves with our own minds. From the Buddhist point of view, the human mind is already awake and liberated. Its nature is compassionate and fully present. No matter what kinds of meditation we practise, all of them are aimed at increasing our mindfulness and presence, facilitating inner peace, and enabling us to deal with our emotions in a healthy way. The human mind is often fondly compared to an untamed monkey, wildly jumping around. We often don’t realize this until the first time we sit down to meditate and try to concentrate our minds on one simple thing, such as our breath. Thoughts and feelings then begin to jump around wildly all over the place, usually uninterruptedly. In meditation, we can learn to tame our minds with patience and through this to truly free ourselves from constraints of all kinds. The first thing to do is to structure one’s life and surroundings in a way that makes it easier for the mind to settle down. This includes such things as setting up an undisturbed place where we can meditate regularly. As a rule of thumb, it’s better to mediate for shorter sessions each day than for instance one long session once a month. Meditation is traditionally exercised in an upright posture in the lotus position. However, what’s more important than the artful crossing of your legs is that your back and spinal cord are in an upright position. If you are unable to sit on the floor, then an upright position on a chair is completely fine. Quite possibly no other Buddhist tradition has as many forms of meditation as Tibetan Buddhism. Meditation sessions always begin with a prayer involving the taking of refuge and the developing of an enlightened mind (bodhicitta). One consciously reminds oneself that the training of one’s own mind is the most important tool on the way to liberation and that to do this we need help – we need to take refuge in the Buddha, in the teachings of the Buddha (dharma), and in the community of practitioners (sangha). We pray that our wish for enlightenment will be strong and that we will also be able to liberate all other sentient beings. Wishing for the end of suffering for all beings means to feel compassion, which is the essence of the enlightened mind. Meditation is not just about helping us to relax or reduce stress. It is something that can help us increase our awareness, develop more mindfulness, and achieve a deeper sense of joy and appreciation. In calm abiding meditation – called “shine” or “samatha” in Tibetan Buddhism – we direct our mind towards a point of concentration, for example our own breath. The thoughts that arise are observed in a nonjudgmental way and we simply let them go. Through this practice, the mind eventually begins to calm down. A relatively calm mind is the basis for other forms of meditation. When the mind stops constantly engaging in discursive thoughts, it has more room to observe things without evaluation. On the basis of a calm mind, insight meditation – called “lhaktong in Tibetan – attempts to perceive directly. This happens through the various forms of mindfulness meditation. For example, by paying close attention to one’s physical body parts in a nonjudgmental and direct way, tension can be released purely through awareness. Or you focus on your own breath. You feel the rising and falling of your abdomen and the flow of air through your nostrils when breathing in and out. It is possible that the “experiencing entity” experiences itself in the meditation and recognizes the direct nature of its own mind. Gaining a certain amount of confidence in the so-called introductory meditation techniques creates the ideal conditions for deeper kinds of practices. In Tibetan Buddhism, these include analytical and focused meditation on the one hand and the visualization of yidams on the other. Yidams are enlightened buddha aspects, which are often referred to as deities as well. In analytical meditation, one uses logical thinking processes and the conclusions one reaches through these to try and penetrate certain concepts, such as compassion. Afterwards, one meditates deeply on this in order to reinforce what has been understood. For example, if we come to the understanding that all sentient beings strive for happiness and freedom from suffering and at the same time understand that out of ignorance they are creating suffering for themselves, then we have a heartfelt wish that they recognize the true causes of happiness and that they attain such happiness. Such a state of loving kindness is something we can realize, stabilize, and abide in. Loving kindness therefore stops being just a mere thought and becomes an emotional quality. With this kind of preparation, Vajrayana meditation practices, such as the visualization of buddha aspects, also have a deep effect. The yidams that one visualizes are not beings independent from oneself, but are mental forms through which practitioners discover their own innate enlightened nature. The same is true for the so-called guru yoga practice. In guru yoga practice, practitioners identify their minds with the enlightened mind of the guru. This could be a specific enlightened teacher or a completely realized teacher from the transmission lineage, such as Padmasambhava (traditionally thought to be the founder of Buddhism in Tibet) or the Karmapa. Mahamudra literally means the “great seal”. The highest Buddhist teachings are considered the basis for mahamudra. The practice itself is to be regarded as a path and the experience resulting from it as the fruit, which is quasi permanently “sealed”. The mahamudra approach is often regarded as the essence of Buddha’s teachings. Under favourable conditions, the practice can lead to enlightenment in one single lifetime. The realization attained through it can be described as the “realization of the highest reality”, “realization of the nature of mind”, or simply the “realization of buddha nature”. In this perfect state, all dualistic concepts of the mind are transcended. It is a permanent experience of an “absolute reality”. With the dzogchen practice – dzogchen literally means the “great perfection” – Tibetan Buddhism also developed a stage-less path aimed at direct realization. Dzogchen presupposes that all of us already have true buddha nature but that we are unable to recognize it due to temporary obscurations. The introduction to this original awareness by a realized dzogchen master is crucial to this. Dzogchen is also regarded as the path of self-liberation, which allows everyone to realize their true nature beyond duality. 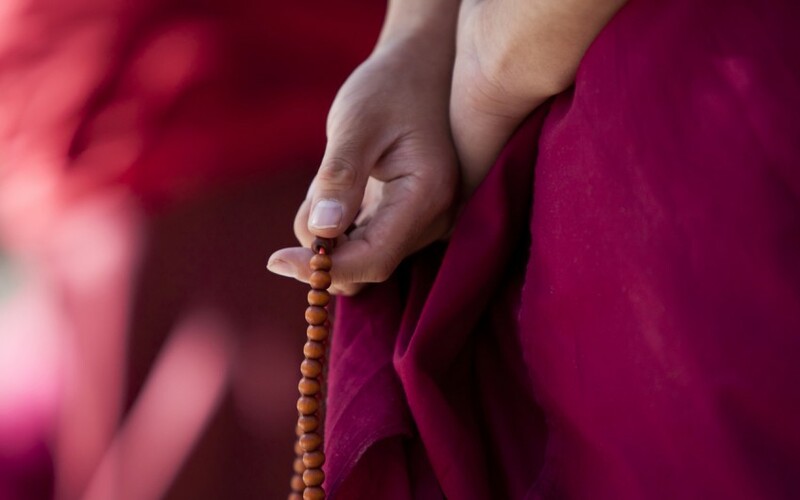 The many different kinds of meditation practices of Tibetan Buddhism may appear confusing at the beginning, developed as they were over many centuries in a monastic culture that is foreign to us, to say the least. The most important thing, however, when choosing a form of meditation is to take the advice of an accomplished teacher and to consistently practise the meditation methods he or she recommends. This enables us to attune ourselves to a meditative lifestyle each day. Buddhist meditation practices help us to change the way we perceive things and through this to create the conditions that contribute to a fulfilling life for the well-being of all living beings. Dzogchen Pönlop Rinpoche, Rebel Buddha.